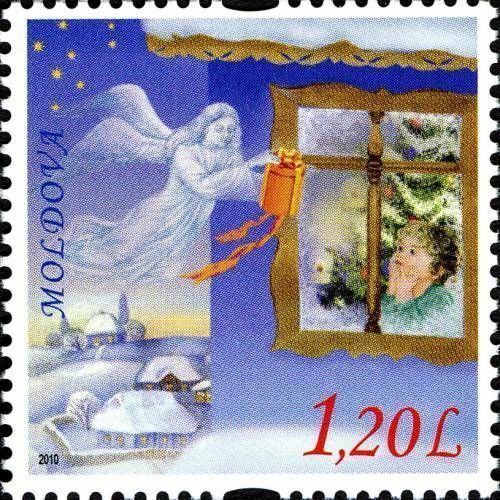 On 7 December 2010, the Post Office of Moldova (Poșta Moldovei) issued a series of postage stamps with the title Christmas 2010 and New Year. 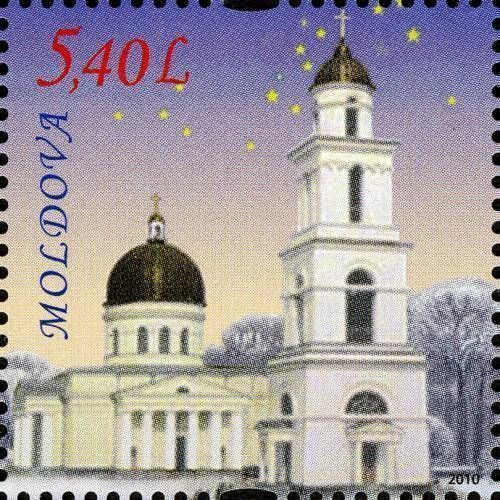 The issue comprises two stamps (one on a souvenir sheet), with associated cancellation (postmark) and first day cover (FDC). The designer was Vitaliu Pogolşa. The printing was performed by Tipografia Centrală, Chişinău. The Cathedral of Christ's Nativity (Romanian: Catedrala Mitropolitană Nașterea Domnului) is the main cathedral of the Moldovan Orthodox Church in Central Chișinău, Moldova. It was commissioned by the governor of New Russia, Prince Mikhail Semyonovich Vorontsov, and Metropolitan Gavril Bănulescu-Bodoni in 1830. The cathedral was built in the 1830s to a Neoclassical design by Abram Melnikov (who had designed a similar church in Bolhrad). The cathedral was bombed during the World War II, and its bell tower was destroyed by the local Communists in 1962. The new bell tower was constructed in 1997. The restoration of the interiors is apparently still under way. Read more.. This article uses material from the Wikipedia article 'Nativity_Cathedral,_Chi%C8%99in%C4%83u', which is released under the Creative Commons Attribution-Share-Alike License 3.0.